a. Merchant with OpenCart 2.0 to 2.2.
b. For OpenCart version 2.3, please refer here. c. For OpenCart version below 2.0, plase refer here. d. Merchant with OpenCart account. a. Download the senangPay OpenCart plugin. b. Next, upload the plugin files to OpenCart via cPanel / FTP. 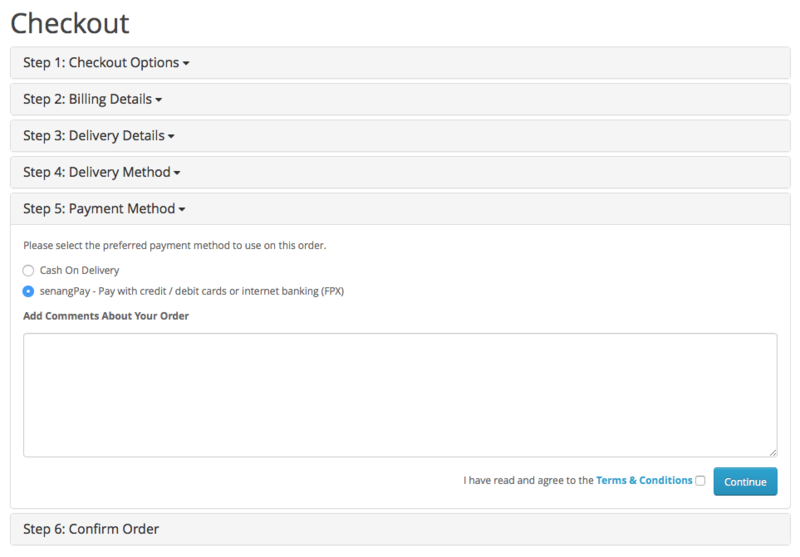 c. Then, enable senangPay setting from OpenCart. c. Get your Merchant ID, Secret Key & OpenCart + senangPay URL for the integration from senangPay Dashboard. d. Insert your Merchant ID & Secret Key to your OpenCart. e. Insert your Return URL and Callback URL to your senangPay dashboard. f. And finally, test your shopping cart. 1. Please download the plugin below. 2. The files name is senangpayopencartplugin.zip. 3. Extract the zip files. 4. You will see 2 folders in the extract files under the folder “upload” which are folder “admin” and folder “catalog.” Please take note that these are the files that you need to upload to your OpenCart folder in the server later. Now, you need to login to your OpenCart and check whether the senangPay payment gateway is already in the list or not. By default, senangPay will not be in the list. 1. Please login to your OpenCart. 2. 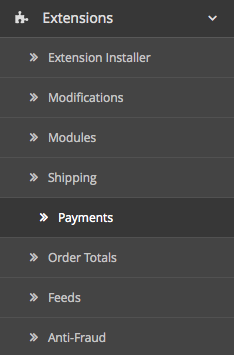 On the menu, go to Extensions > Payments. 3. You will see a list of existing payment gateways that are already registered with OpenCart. Please take note that senangPay is not yet in the list. Now, you need to upload both folder “admin” and folder “catalog” to your OpenCart folder in your server. You can do this via your cPanel login or via FTP software. 1. 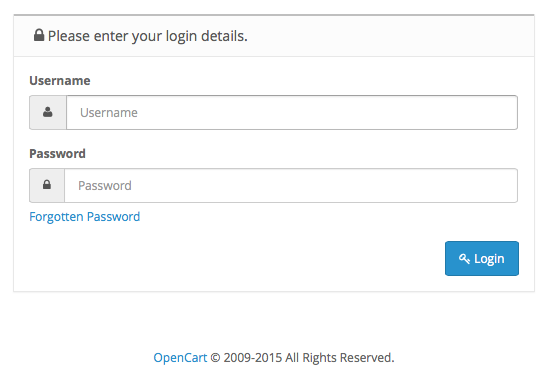 Login to your FTP ( or cPanel ) of your server where you host your OpenCart. 2. Browse your OpenCart folder. You will notice that the “admin” and “catalog” folder is already existed in the server. 3. Open your OpenCart folder and you will see both “admin” and “catalogue” folder. 4. Copy both of the “admin” and “catalog” folders that you have uploaded before and upload the folders to the server. After you replace both folders, you need to check in your OpenCart Payment list whether senangPay Payment Gateway is listed or not. You should see senangPay listed if you have uploaded both folders. Next, you need to enable the senangPay plugin as the plugin is currently disabled. First, you will need to install the senangPay plugin. 1. Go to the Payment listing. 2. 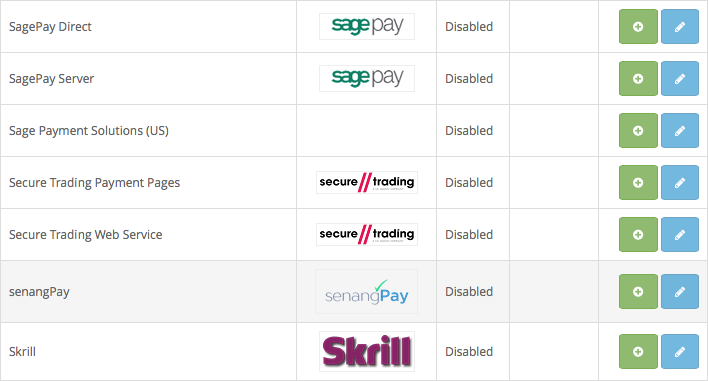 On the senangPay list, click the green icon to install. 3. You should see a response from OpenCart telling you that your installation is successful. 4. The previous green icon will change to red color. This means that your senangPay plugin is already installed. 5. On the senangPay list, click on the blue icon to edit. 6. You will see a new page with spaces to fill. 7. You need to get Merchant ID and Secret Key from your senangPay Dashboard. The URL above is based on assumption that you installed OpenCart in your base directory. Please change yourwebstore.com to your domain name accordingly. 7. Lastly, click ‘Save’. For more info on Callback URL, read here. Now, this is the almost last part. Finalizing the OpenCart setting. 1. On the previous senangPay setting page, insert the information that you have copied before. 2. Insert your “Merchant ID” that you copied from your senangPay Dashboard. 3. Insert your “Secret Key” that you copied from your senangPay Dashboard. 4. On the Order Status, select “Processed”. You can also select other preference based on your business process. The order status is the new status for the order after the payment was made. 6. Last, click “Save,” on top right of the setting page. 7. When you go back to the payment listing page, you’ll see that the senangPay payment gateway is already enabled. Now, this is the last part. You need to test your integration whether its working or not. 1. Go to your OpenCart front end store. 4. You will see senangPay in the Payment Method tab as below. 5. When you confirm order, you will be directed to senangPay Payment Form. 6. Congratulations, your Online Business is now on another triumph level! If you are not using the default theme of OpenCart, then, you need to create a folder called ‘payment’ in your theme folder and copy files “senangpay_failed.tpl” and “senangpay.tpl” into your theme folder. Make sure folder catalog/view/theme/your_theme_folder/payment/ contains the 2 files. If your site does not look like as the image below then you are not using the default theme. …please refer to section “If you are not using the default theme of OpenCart” above and check that you have copied the 2 files in your theme payment folder. Previously, we received several complaints regarding the absence of order/purchase on merchant’s website, but senangPay has recorded the purchase on the Transaction list in Dashboard. Merchant can search for the mysteriously “missing” order by going to the “Missing order” list in the OpenCart admin page. However, this issue has been fixed in our latest plugin. 1. The current supported language for this plugin is ENGLISH only. 2. The “$” in OpenCart is equal to “RM” in senangPay Dashboard. 3. 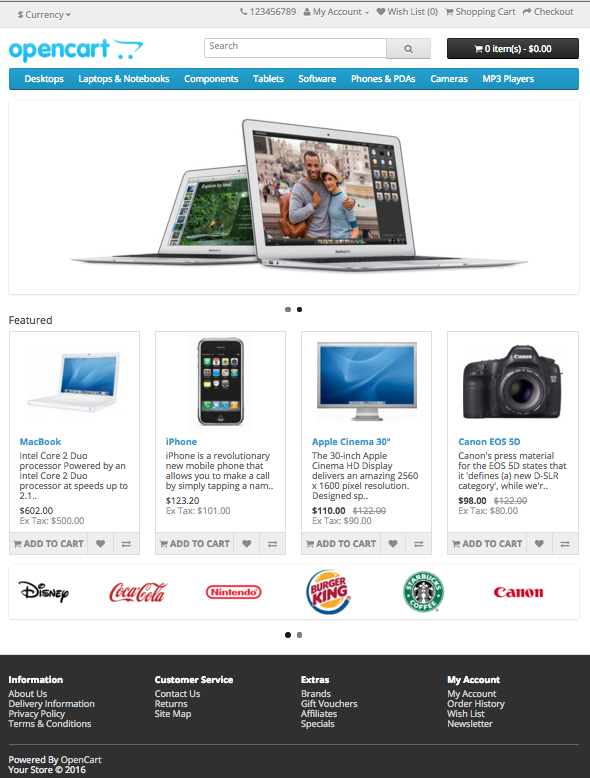 The plugin is designed for OpenCart 2.0 and above. For version below 2.0, please refer here.